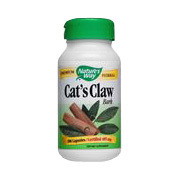 Cat's Claw bark with a guaranteed natural potency of 3% alkaloids. A traditional tonic herb for well being, Cat's Claw was historically used by the indigenous people of South America to stimulate the immune system in a variety of serious ailments. 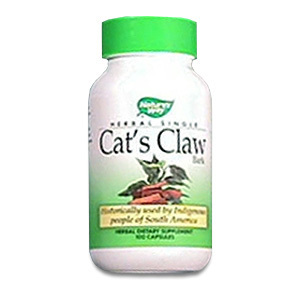 Cats Claw (Una de Gato, Uncaria Tomentosa) promotes and enhances immune system function, anti-viral, anti-inflammatory, and anti-rheumatic activities. Cats Claw has been shown to help arthritis, allergies, candida, chronic fatigue, fibromyalgia, gastritis, ulcers, abnormal cell growth, cleanses the intestinal tract, and hormonal imbalances. Historically used by Indigenous people of South America. Cat's Claw bark (uncaria tomentosa 485mg and millet), a woody vine that grows wild in the Peruvian rain forests, will often grow to be over 100 feet in length. Indigenous people of South America use this herb for a number of health related problems. Cat's Claw is another pertinent example of the new herbs being discovered in rainforest jungles. As an addition to the daily diet, take two to three capsules three times daily, preferably with food. Cat's Claw Bark (Uncaria tomentosa 485 mg and millet). Cat's Claw Bark is shipped in a discrete, unmarked package. Orders are processed immediately and usually take about 3 to 5 working days to be received. We do ask that you try it for 2 to 3 weeks to feel the full effects. Any information received is used only for order processing and shipping purposes. Your information, such as e-mail address, will never be disclosed to a third party.